So it’s Spring, which is a beautiful thing. Except that my children have been rising with the sun. The very early sun. Before we go any further, I must come out as strongly against The Morning. Specifically, all of the hours before 8:00 am. I cannot get behind anything that causes me to get up during the 6:00 hour. Especially when that thing is hollering my name repeatedly. I know all you more seasoned mothers are laughing at me. And the rest of you non-morning people might be sympathetic, or you might be laughing also, maybe a little maliciously, because I was lucky enough to be sleeping in until Spring struck this year, and now you want to welcome me greedily into this evil morning club and say it serves me right and this is only fair. But whatever. We need a morning solution. We need something (besides children) to wake up for. And that thing is yeasted waffles. We need these beautiful waffles because they are just waiting to be cooked when we stumble into the kitchen and blearily splash coffee into the enormous waiting mug. We need things that cook themselves with little oversight while we adjust to the daylight. These waffles are essentially fermented. Don’t freak out. It’s going to work out so well for you. Just mix and leave out on the counter over night! The next morning, they will be perfect. They are also a great sweet, bready selection for hosting a brunch (you know, if it’s not o’dark thirty and you’ve had more time to wash your face and put on your cute jeans: if you are making these waffles at a more civilized, less child-and-sun-driven hour of the day….)! We all know make-ahead is the key for a stress-free brunch, amiright? I will say that this batter is quite thin, and it won’t work as well in a Belgian-style waffle maker because it won’t fill all of the crevices. 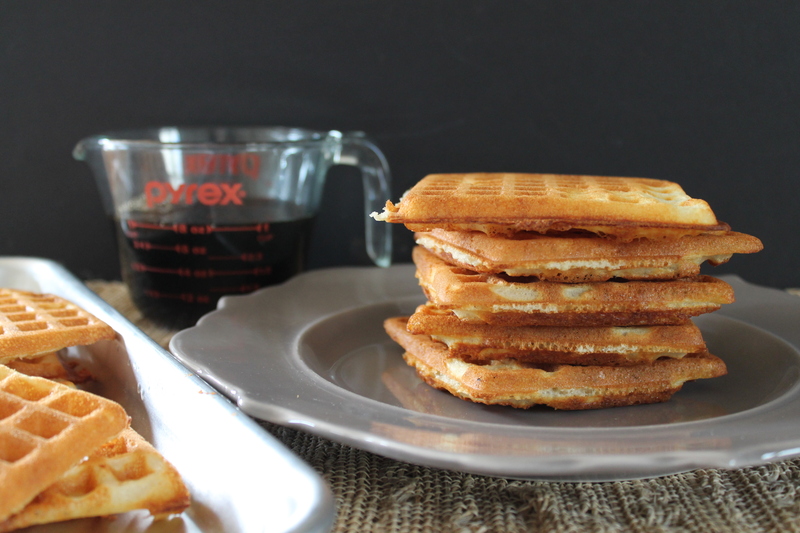 I happen to have a very old-school, thin, square waffle iron, and that ancient machine is perfect for this recipe. 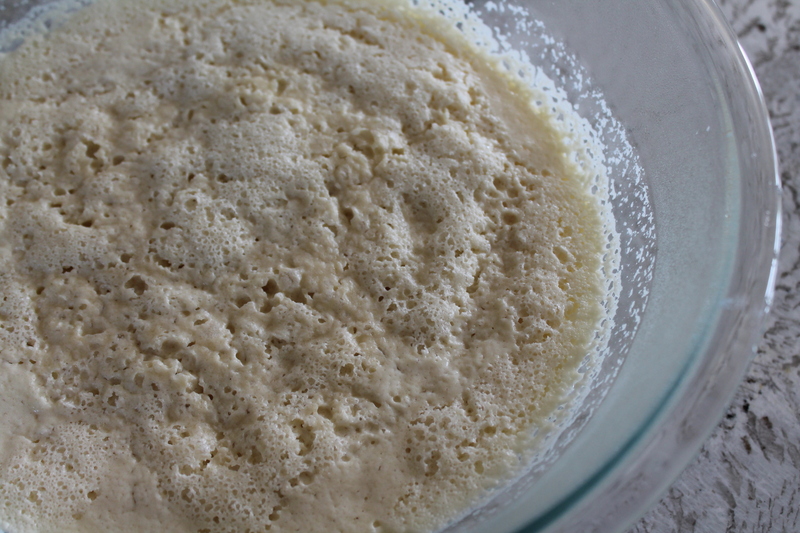 When the yeast mixture is nice and foamy, stir in the warm milk, melted butter, flour, salt, and sugar. Whisk until everything is even. Now cover up the bowl tightly with plastic wrap. And walk away. And go about your business. Get a good night’s sleep, because morning comes early. That bowl can just relax on the counter. Before you get all nervous about the milk and the counter, let me remind you: I did tell you that the waffles are fermented. Just let it happen. Let the milk ferment on the counter. This is just like making your own buttermilk the very slow way, by allowing the milk to curdle naturally at room temperature. And we all know that buttermilk makes some delicious, tender baked goods and morning breads. 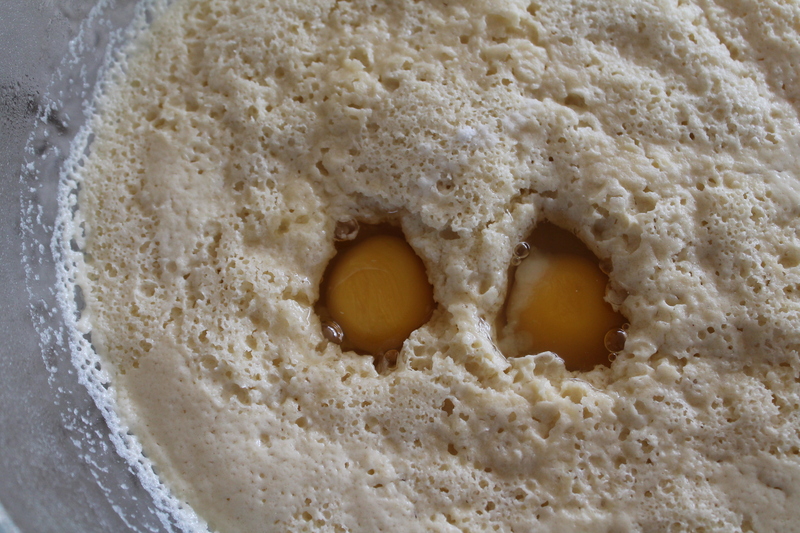 The next morning, that batter is going to look a little puffy and chunky. When you open up the plastic wrap, the first whiff will help you wake up. Haha. Whisk in two eggs and some baking soda while your waffle iron heats up. 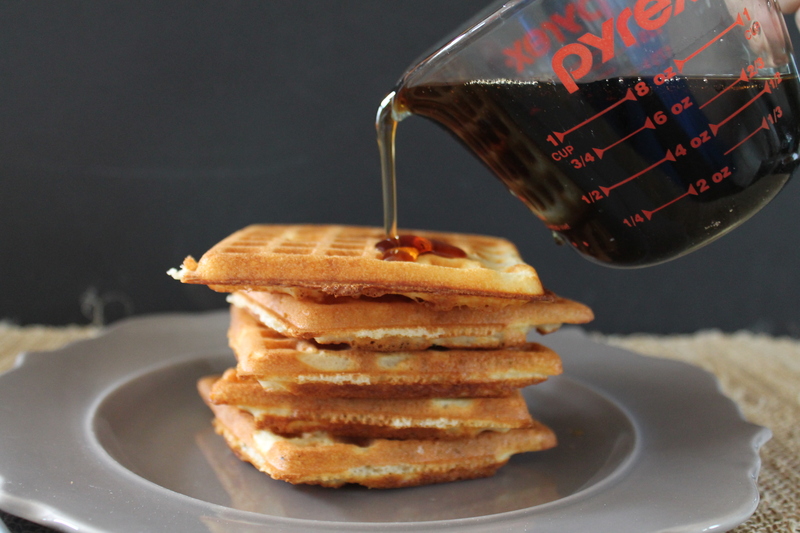 Then grab your ¾ cup measure and scoop the batter into the hot waffle iron. Close that sucker up and bury your head in your arms or guzzle another steaming mug of your best friend, coffee. I do recommend keeping the cooked waffles warm in the oven while you wait, if you are the kind of person who doesn’t serve breakfast in stages while you continue cooking. In my opinion, a waffle should always be warm enough to melt butter into little pockets and puddles. Yum. Serve with syrup. Because sugar will also wake you up this morning. Stir together the warm water and yeast. Let it sit on the counter about 10 minutes to activate: the mixture should become thick and foamy. 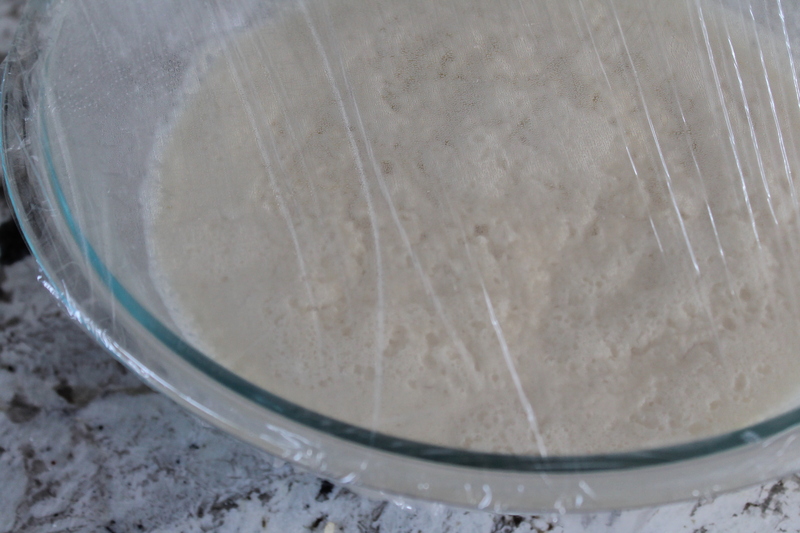 Transfer the yeast mixture to a very large (at least 2 qt.) bowl. Whisk in the warm milk, melted butter, flour, salt, and sugar until a thin batter forms. Cover the bowl tightly with plastic wrap and let it sit on the counter overnight, up to 12 hours. In the morning, whisk in the eggs and baking soda. Heat a (square) waffle iron to very hot. Coat lightly with cooking spray. 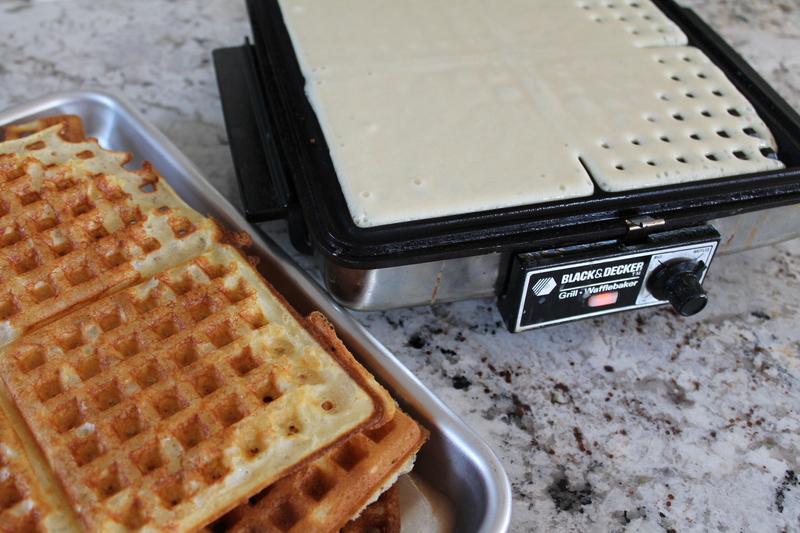 Pour ¾ cup batter into the waffle iron. Cook 6–8 minutes, or until browned and crisp. 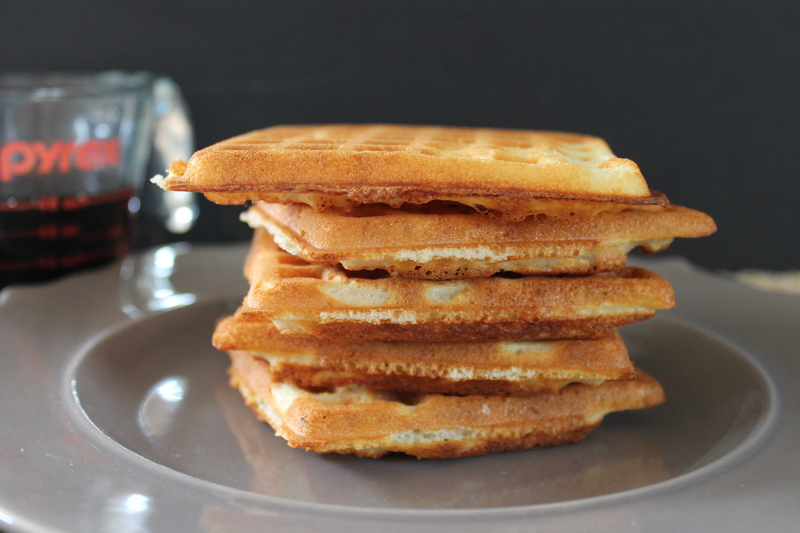 Remove from the waffle iron and keep warm in the oven while cooking the remaining waffles.